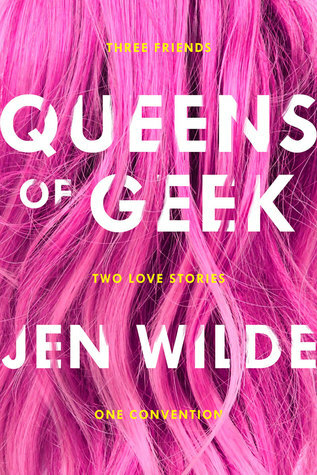 Queens of Geek is an adorkable and inspirational look at fandom life, friendship, love and being happy with who you are. It’s the perfect pick-me-up book, the perfect read to make you smile and restore your faith in humanity. A must-read! I am seriously tempted to quote almost every single page, because it’s so awe-inspiring and swoon-worthy. But since that might just be overkill, I’ll just give you some highlights. Fandom and geekiness at its’ finest. The story takes place during just 3 days. But not just any random 3 days. They take place during SupaCon, a major fandom convention, so be ready for lots of geekiness! Plus it follows three best friends, Charlie, Taylor and Jamie, who are proud supernerds who have dreamed their whole lives of coming to SupaCon. Meaning, we get to experience the wonder of a fandom convention through their eyes and since I’ve been dreaming about attending a convention such as this for ages as well, I was in awe. Not only is it such a fun and unique setting that I wish I could have been at, but the book is also filled to the brim with fangirliness and pop-culture references and all that just made me so happy. No better way to my heart than a few Supernatural, Felicia Day, Star Wars, The Breakfast Club or The Craft references! Epic friendships. Well, another way to my heart is by writing a realistic but still epic friendship and boy, did Queens of Geek deliver. We follow these three best friends, whose friendship runs so deep and is so beautiful, despite their differences. The amount of support, understanding and loyalty they have for eachother kind of made me tear up several times. Relatable and diverse characters. Charlie is a bisexual Asian-American youtuber and rising actress with a lot of confidence and empathy, even though she just went through a very painful and very public break-up. Taylor is a supersweet superfan who is on the Autism spectrum and has anxiety. And Jamie is a latinx extrovert who has been in love with Taylor for ages and is just the sweetest and most supportive teddybear imaginable. All three of them are so well-written and relatable. Though we only get Charlie’s and Taylor’s POV, which was a pity because I would have loved to see Jamie’s POV as well. The romance. As the cover tagline promises, we get not one, but two love stories here. One is between Charlie and Alyssa. Alyssa is the popular youtuber and actress who Charlie has had a crush on forever. At the con she finally gets to meet her idol and when they agree to film a collab video together, sparks fly. Their romance was sweet and thoughtful, and features a date that is basically the perfect date, but the only downside was that it was just a teensy bit too insta-lovey for me. Taylor and Jamie, on the other hand, had me swooning from the very start with their best friends-turning-into-lovers story. Their romance felt so real and well-developed and I loved it. The messages. Though there isn’t that much of a plot (it’s basically three friends finding themselves at a fandom convention), the messages spread throughout the book are just possitive and brilliant and uplifting. They made me want to quote every single page and recommend this book to EVERYBODY. I mean, it tackles so many important topics, from anxiety to fat-shaming, from biphobia to misogyny in the movie industry, and from the importance of friendship and support to the power of fandom. Did it feel a little cheesy and preachy at times? Yes, but the messages were so beautifully written and inspirational that I’m willing to overlook that. So overall, I highly recommend this heart-warming and adorkable story to anyone. Any fan, nerd or geek will love this, but mostly just about anyone in need of some positivity, fluff and inspiration. Have you read Queens of Geek? What did you think about it? This sounds so cute! The cover is so fun. Also, I love that you used the word “adorkable” – my husband calls me that! Ah, I do love the word adorkable 🙂 That’s so cute that your husband call you that! This is the first review I’ve read for this book and it sounds fantastic. Definitely adding it to my summer reading list. Great review! I really loved it so I’m happy to hear you’ve added it to your TBR 🙂 Hope you’ll enjoy! I absolutely LOVED this one! Glad to hear that you enjoyed it too. It was actually my favorite book of the year so far. I can definitely see myself reading this one many times. Great review! Love that you added the quotes! I have read Queens Of Geek and OMG I LOVED IT SO MUCH! It was well written and relatable and so cute! I loved how it was by an Australian author too and I’m so glad to see it getting lots of buzz and hype because it 100% deserves it! Lovely review Lindsey!